FIRED UP. Last year, besides performances at Eau Claire’s Kjer Theatre, Population: 485 was also staged at Big Top Chautauqua in Bayfield, WI (above). If you missed the stage adaptation of Michael Perry’s beloved Population: 485 last summer in Eau Claire, and didn’t make it to the Lake Superior Big Top Chautauqua performances, director Jake Lindgren has some good news for you. 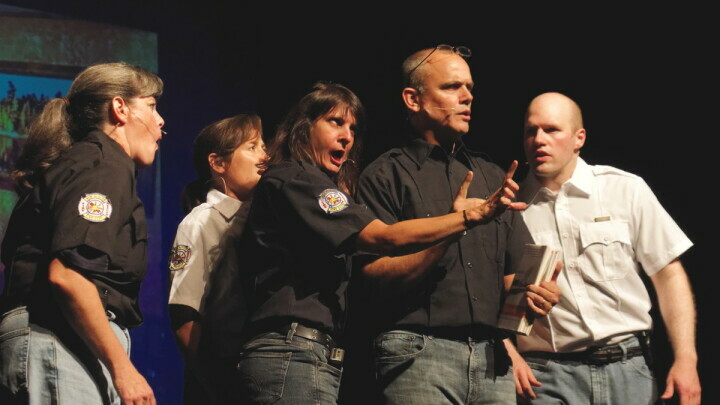 The performance, featuring with the original cast and crew (minus one cast member, who was replaced), is coming back to the Kjer Theatre on the UW-Eau Claire campus on May 12-14. And that’s not all. The entourage is taking its creation on tour to various performing arts centers around the state until March 2018. The goal is to hit all “major corners” of the state. The two shows that have been announced so far outside of Eau Claire are a return to the Lake Superior Big Top Chatauqua on Aug. 25 and a trip to Washington Island on July 8. Those who saw the first performances in Eau Claire might remember the live music done by Sean Carey, which Lindgren said is easily his favorite part. At the Big Top, Perry’s friend Molly O. provided the live music. “She brought in a fiddle and mandolin and added a whole new layer of beautiful, stunning, heartbreaking music,” Lindgren said. Unfortunately, scheduling nearly a year of tours with S. Carey and Molly O. proved difficult. So they took the best of both worlds and reworked some of the music, recording a score they will now use for the performances. “We do lose the live aspect of it, but we have the soundtrack that still brings tears to my eyes just hearing it on my iPod in the car,” Lindgren said. This way the show keeps its authenticity, an important aspect for Lindgren and, he’s noticed, the audience. Both in Eau Claire and at the Big Top, Lindgren said the audience’s response was emotionally charged. 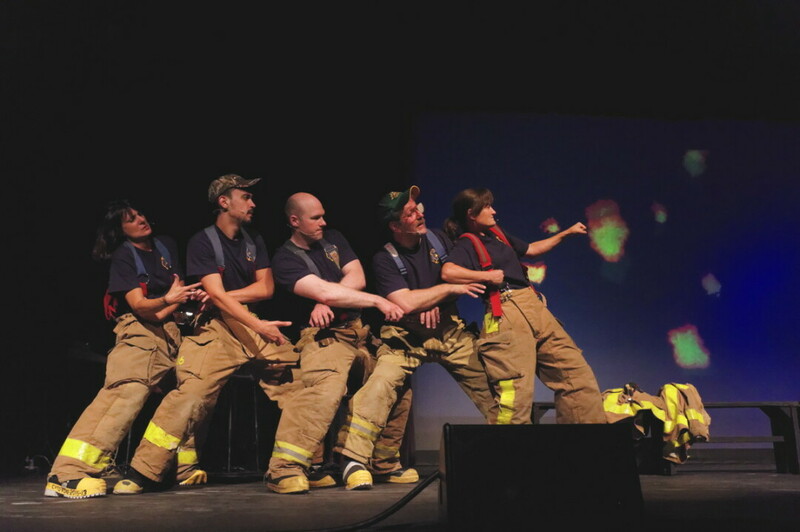 His favorite part has been speaking with local volunteer firefighters and EMTs who come to the shows. Working with a cast and crew made up of entirely Chippewa Valley natives and transplants has also been rewarding for Lindgren, founder of the Eau Claire theater company Downstage Left. He said it’s a testament to the resurgence of the arts and culture scene in the Chippewa Valley right now, and he wants to run with it as long as he can. Population: 485, the stage adaptation, returns to Eau Claire on Mother’s Day weekend, and if you’re asking Lindgren for Mother’s Day gift suggestions, he thinks tickets to the show would be a great “alternative gift.” Performances are at 7:30pm Friday-Saturday, May 12-13, and 1:30pm Saturday-Sunday, May 13-14. Tickets are $20 for adults and $15 for students and can be purchased online at uwec.ticketforce.com.